Carriage garage doors can add a great deal of charm to homes in just about any architectural style. Unfortunately, your average garage is not set up to accommodate a traditional swing-open carriage door. Our carriage style garage doors in Brentwood CA give you all the beauty of a carriage door in a roll-up design that works just like your existing garage door. Professional installation is key to ensuring the quiet, reliable, and efficient operation of your carriage garage doors in Brentwood CA. With Carroll Garage Doors on the job, you can rest assured you are getting quality installation to prepare you for years of trouble-free operation. Every garage door installation we provide comes with warranty coverage and free weatherstripping. 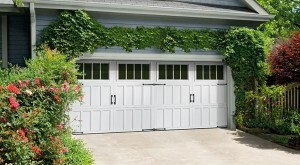 Need Service for Carriage Garage Doors in Brentwood CA? We are happy to help homeowners who already have carriage garage doors in Brentwood CA, whether they bought them from us or not. Our technicians are trained on all makes and models of carriage doors, including swing-open and roll-up designs, and can provide all the maintenance and repairs you might need. Whether you know what’s wrong with your garage door or not, we can draw on our 19 years of experience to help provide a fast and effective solution to the problem. Whether you are interested in getting brand new carriage garage doors in Brentwood CA or improving the ones you already have, simply give us a call to schedule prompt and courteous service.